3" deep 12 gauge formed shelves. 12"W x 17"L x 4"H locking storage drawer. 800 lb capacity, 400 lbs per shelf. 5" non-marking polyurethane casters, 2 swivel and 2 rigid. The Little Giant Heavy 12 gauge formed shelves are 3" deep and welded to tubular steel frame with handles at both ends. 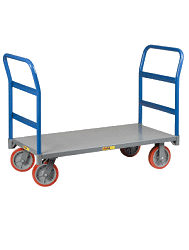 2 swivel, 2 rigid casters with 5" non-marking polyurethane wheels. Overall height 36", clearance between shelves 20". Features large lockable storage drawer that conveniently opens below the handle. Storage drawer measures 12-1/2" W x 17" L x 4" H.